More than thirty faculty houses were built on the campus by the end of the term of Cornell’s second president Charles Kendall Adams in 1892, one cluster built during the 1870s along the south end of Central Avenue, and a larger one along the length of East Avenue the following decade. Cornell University Campus, 1891. David Rumsey Map Collection, Cornell University. ​During the early decades of Cornell’s history many members of the faculty lived on the campus in homes built on land leased from the university, while students lived in boarding houses in town. This arrangement was much favored by the founding president Andrew Dickson White and his immediate successors but became untenable as the university began to grow, fueled by such events as the establishments of schools of engineering, law and medicine and the New York State College of Agriculture at Cornell in 1904. Between the late 1890s and World War I, the number of faculty members grew to almost 300 and student enrollment to 5,000. As a result, the board of trustees began to buy up and tear down the faculty houses in order to replace them with academic buildings and dormitories on campus, which of course left the professors in need of someplace else to live. Men of means in Ithaca, recognizing the potential faculty housing market that university growth was producing, cast their eyes on the plateau of land at the northern edge of the Cornell campus on the same elevation the other side of Fall Creek Gorge. Land there was destined to be divided into three privately financed real estate developments in years ahead: Cornell Heights hugging the north rim of Fall Creek Gorge, Renwick Heights sloping down toward Cayuga Lake on the west side of the plateau, and Cayuga Heights on more adjoining land north and east. Two men were instrumental in making the whole area accessible during the decade of the 1890s by building a streetcar line and bridges over Fall Creek so that they could set about developing Cornell Heights. 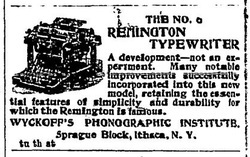 One was Edward G. Wyckoff (1867-1924), member of the Cornell class of 1889 and an heir to the Remington typewriter fortune, who owned a number of Ithaca businesses. The other was Herman Bergholtz (1865/66-1938), a Swedish immigrant and electrical engineer who, shortly after arriving in town in the early 1890s, with financial backing purchased the Ithaca Street Railway and Lighting Company. ​Wyckoff and Bergholtz were typical of the “streetcar entrepreneurs” who built electric trolley lines replacing horse drawn vehicles in the late nineteenth century, thereby making possible development of the modern American suburb. The general manager of the street railway system in Ithaca wrote that the line "passed through the best residential portion of the city, the university campus and a beautiful new residential section lying on the edge of the main gorge and commanding a magnificent view of the lake and the valley at its head.” H. S. Cooper, “The Street Railway System of Ithaca, N.Y.,” The Street Railway Review (1895-1905), June 15, 1900, Vol. 10, No. 6, p. 308. Herman Bergholtz had a trolley track laid from downtown Ithaca up State Street hill and onto the center of the Cornell campus between 1892 and 1894. In the remaining years of the decade he and Edward Wyckoff entered into a series of land deals in Cornell Heights. In 1896, with Wyckoff putting up the larger share, they invested in forty acres north of the gorge bounded by Kline Road to the west and Triphammer Road to the east and then, jointly with their attorney DeForest Van Vleet, formed the Cornell Heights Land Company capitalized with $75,000. A year later Bergholtz sold his share of the company as well as the street railway, to Wyckoff for $150,000 while he turned his attention to developing Renwick (now Stewart) Park down on the lake. ​This left to Wyckoff the financing of two trolley bridges across Fall Creek Gorge between the Cornell campus and the Cornell Heights Land Company acreage on the other side. The first was completed in 1897, a span of 200 feet from the end of East Avenue at the southeast corner of the campus near Beebe Lake to Triphammer Road. The second was finished by 1899 crossing the creek on Stewart Avenue at the campus southwest corner. Tracks were laid down the center of both bridges to connect with an extension of the streetcar line along Thurston Avenue north of the gorge. The first round-trip around the completed loop of the Ithaca Street Railway and Lighting Company Line was taken July 28, 1899 up from downtown Ithaca across the Cornell campus, over Triphammer Bridge through Cornell Heights along the gorge rim at the Knoll, which afforded a spectacular view of the city and lake over 400 feet below, then across the creek again on the Stewart Avenue bridge, through Cornell and back downtown. A third, suspension bridge was completed in 1900 for Cornell faculty and anyone else who might choose to commute to the campus on foot. Cornell Heights map, 1898, drawn by civil engineer Kirk P. Crandall (1846-1910), identified on interpretive signage as the designer of the Stewart Avenue Bridge. He was a brother of Charles Lee Crandall (1850-1917), an early professor of civil engineering at Cornell, and an uncle of Carl Crandall (1890-1968), who also taught at Cornell and served as the first civil engineer of the Village of Cayuga Heights for over fifty years: S. C. Hollister, William McGuire, and J. C. Gebhard, “Carl Crandall, July 22, 1890 – April 25, 1968,” Cornell University Faculty Memorial Statements. ​Edward Wyckoff hired landscape architect William Webster (1818-1911) of Rochester, New York to lay out the roadways of Cornell Heights following “the romantic tradition of the ‘ideal’ residence park . . . popularized by Frederick Law Olmsted after the Civil War.” This meant a “curvilinear street plan” with winding roadways following natural contours of the land as well as “lavish landscape features.” Webster plotted a hundred building sites, averaging one hundred feet in width, twenty of which were sold by the end of 1900. No commercial buildings were allowed, and according to the deeds of sale all houses were to be architect designed with Wyckoff, who built a mansion for his own family designed by prominent Ithaca architect William Henry Miller, retaining right of approval. ​Two Ithaca law partners, Jared Treman Newman (1855-1937) and Charles Hazen Blood (1866-1938), along with Cornell professors John Tanner and Charles Hull, joined Edward Wyckoff to extend Cornell Heights. In 1902 they formed the Cornell Heights Improvement Company in which Wyckoff held 248 shares and Newman and Blood one each, to develop an 86 acre farm that they purchased from Franklin Cuthbert Cornell (1837-1908), the second son of university founder Ezra Cornell (1807-1874). ​A portion of the farm reached “northward outside the city boundaries into what was to become Cayuga Heights.” Roughly half, or 44 acres, of the purchase, was sold almost immediately to the Ithaca Country Club. 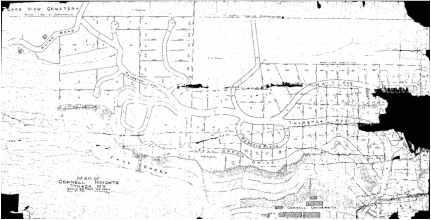 The other portion was subdivided bringing the total number of building lots in Cornell Heights to 151 with roadways, sidewalks, sewer lines, fire hydrants, water and electricity all installed at the expense of the new company, as had been the case with the original forty acres in the development. In 1903, increasing costs and responsibility for the physical infrastructure led Edward Wyckoff to propose the annexation of Cornell Heights by the City of Ithaca. The city accepted the offer and in lieu of any sale price agreed not to tax his mansion and the property where it stood off Wait Avenue for fifteen years. The arrangement wasn’t needed for that long, however; despite Wyckoff’s “concerted efforts,” Cornell fraternities began moving into some of the grand homes in the neighborhood, and succumbing to financial pressure, he sold his to Phi Kappa Psi in 1916. ​In 1989, Cornell Heights was recognized as “an exceptional, intact example of a turn-of-the-century planned residential community” and added to the National Register of Historic District as the Cornell Heights Historic District. Roughly half of the homes in Cornell Heights were built by the beginning of World War I, the other half by World War II, all of them coexisting since then with more Greek houses, student cooperatives, and apartments. In many ways the early history of Cornell Heights set the stage for the roles that Jared T. Newman and Charles H. Blood played as the founders of Cayuga Heights. The entire Cornell Heights Historic District, which takes up less than a third of a square mile, including the portion protruding north from the city into the Town of Ithaca, is much smaller than Cayuga Heights. But the two developments proved very similar to one another, especially in appearance. Were it not for the green signs on Highland and Triphammer Roads announcing arrival in the Village of Cayuga Heights it is unlikely that anyone walking, biking or driving through Cornell Heights today would see any difference. “Officers of Instruction and Administration,” Official Publications of Cornell University, V, no. 16, Catalogue Number 1913-1914, 6-25 and Bishop, 352. Kermit Carlyle Parsons, The Cornell Campus, A History of Its Planning and Development (Cornell University Press, 1968), 126. Cornell Heights Historic District (hereafter CHHD), National Register of Historic Places Registration Form, nomination document prepared for the US Department of the Interior, National Park Service by Kathleen LaFrank (Washington DC, 1989) based on original work by Judith Dulberg, consultant to the City of Ithaca Department of Planning and Development. The Cornell Heights Historic District national register number is 90PR04376. See also: http://www.livingplaces.com/NY/Tompkins_County/Ithaca_City/Cornell_Heights_Historic_District.html. Sisler, “Edward G. Wyckoff, Creator of Cornell Heights,” Enterprising Families, 87-95. 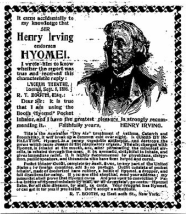 “A Bold Promoter, a Progressive Citizen Who Has Wrought Much Good,” Ithaca Daily Journal, August 8, 1895. Sam Bass Warner, Streetcar Suburbs: the Process of Growth in Boston, 1870-1900 (2nd Edition) (Harvard University Press, 1962) 14. ProQuest ebrary, May 2015. Henry Edward Abt, Ithaca, (Ithaca: Ross W. Kellogg, 1936), 129. “Cornell Heights, a Land Company with $75,000 Capital Organized Today,” Ithaca Daily Journal, April 3, 1897. “Large Deal,” Ithaca Daily Journal, January 11, 1898. “New Bridge across Fall Creek,’ Cornell Daily Sun, 18, no. 16, October 11, 1897. “Statement of Significance,” CHHD, 8. Ithaca Daily Journal, July 28, 1899. Current text of interpretive signage on the Triphammer (Thurston) Avenue Bridge over Fall Creek Gorge, written by staff of the Division of Rare and Manuscripts Collection, Cornell University Library. “Statement of Significance,” CHHD, 1. “New Resident District,” Cornell Daily Sun 21, no. 72. “Tompkins County Title Abstract, 918 Stewart Avenue” (Ithaca, New York) Deeds 154, 415. Abt, 133 and Sisler, 93. “Statement of Significance,” CHHD, 14. Julian C. Smith, Breaking Ninety, a History of the Country Club of Ithaca, 1900-1989 (Ithaca: The Country Club of Ithaca, Inc., 1990), 14-15. “Statement of Significance,” CHHD, 7. Cornell Heights Historic District, An Architectural Walking and Driving Tour (Historic Ithaca, Inc., 1998).